Posted under Health Guides. Updated 18 October 2017. Fast food is food from a restaurant (sit-down, take-out, or delivery) that is quick, convenient, and usually cheap. Fast food is usually higher in fat, calories, cholesterol, and sodium in comparison to homemade meals. Eating too much fast food can increase risk for health problems such as high blood pressure, heart disease, and obesity. Fast food refers to food that can be prepared and served quickly. It can come from may places: sit-down restaurants, take-out, drive-thru, and delivery. Fast food is popular because the food is inexpensive, convenient, and tastes good. However, fast food is often made with cheaper ingredients such as high fat meat, refined grains, and added sugar and fats, instead of nutritious ingredients such as lean meats, whole grains, fresh fruits, and vegetables. Fast food is also high in sodium (aka salt) which is used as a preservative and makes food more flavorful and satisfying. There is no such thing as a “bad” food, but there are some foods you should try not to have on a regular basis. Because fast food is high in sodium, saturated fat, trans fat, and cholesterol, it isn’t something you should eat often. Eating too much over a long period of time can lead to health problems such as high blood pressure, heart disease, and obesity. Since eating a lot of trans fats could cause certain heart health problems, the FDA (Federal Food and Drug Administration) has required that trans fats (from partially hydrogenated oils) be removed from all foods served at restaurants by 2018. People also often drink soda when they eat fast food which adds “empty” calories (calories that don’t make you feel full or provide nutrients) to the meal. It’s helpful to remember that with fast food, moderation is important. Is some fast food healthier than others? Many fast food chains have updated their menus to include healthier options. For example, some chains no longer serve foods with trans fat, and many have menu items that contain fruits and vegetables. Some menus even have special items labeled as “light” or “less than 500 calories” to help consumers easily identify lighter menu items. While lower calorie menu options are not necessarily “healthier,” the calorie counts can be helpful to reference when deciding between a few meal options. If you’re having fast food more than once a week, try to choose from some of the healthier choices on the menu. Go light on the toppings: Added toppings usually means more sodium or unhealthy fats. Don’t overdo the salad dressing. Choose oil-based dressings such as Italian or balsamic vinaigrette instead of creamy salad dressings such as blue cheese and ranch which are high in saturated fat. Use (or ask for) mustard or ketchup instead of mayonnaise or “special sauce”. When ordering pizza, add veggies instead of meat, and get thin crust instead of deep dish. Top your sandwiches with veggies such as onions, lettuce, and tomatoes instead of bacon or extra cheese. Don’t add more salt to your meal. Salt is a major contributor to high blood pressure and heart disease and fast food tends to be loaded with it. Know how your food is made: The way a meal is made says a lot about how healthy it will be. Choose foods that are broiled, steamed, or grilled instead of fried. For example, pick a grilled chicken sandwich instead of fried chicken or chicken nuggets and steamed vegetables or fresh fruit instead of French fries. Choose soups that are not cream based. For example: If the name of the soup includes the word cream or chowder, such as “Creamy Tomato Soup”, choose something else such as a broth-based soup like minestrone or chicken noodle. Dishes labeled deep-fried, pan-fried, basted, breaded, creamy, crispy, scalloped, Alfredo, or in cream sauce are usually high in calories, unhealthy fats, and sodium. When ordering a sub or sandwich, select lean meats such as turkey or grilled chicken instead of items such as burgers, steak, or cheese sandwiches. Ask for sauces or dressings that come with meals to be served on the side and use just a small amount. Practice Portion Control: Meal portions today are almost twice the size that they were 30 years ago. Because of that, we end up eating much more food than we need. Order smaller entree portions. For example, instead of a large sub, try a small sub with a side salad and low-fat dressing or piece of fruit. If you’re getting a side such as french fries, order a small, or kid sized portion. Never super-size anything; these options pack in an even larger amount of calories and fat. Don’t fall for the deals. 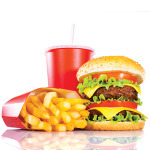 Many fast food restaurants advertise value deals for larger portions of food. These foods may come in what is called a “value box”, a combo pack, or just be a larger portion for a cheap price. If you want the deal, eat only half and save the rest for later, or split with a friend. Remember, you can get too much of a good thing. Even if a fast food restaurant uses healthy ingredients, they still usually give you a lot more food than you need. Eating too much of any kind of food can lead to weight gain. Watch your portions, even when you are eating healthier fast foods such as salads, sandwiches, and soup. Pack up half of your meal in a to-go box to save for another meal since many meals served at restaurants are double or triple the recommended serving size. Setting it aside can keep you from picking at your meal when you are already full. Make the Swap: Look for healthier side options for your meals. Have a salad, steamed vegetables, fruit or soup instead of fries. Choose water, low-fat milk, or diet sodas instead of regular sodas, fruit drinks, or milkshakes, which can be a huge source of calories and sugar. Instead of a slice of pie or cookie for dessert try fruit and yogurt. Hamburger restaurant: choose a grilled chicken sandwich (ask for no mayonnaise) with a side salad and lite dressing or apple slices. Sub sandwich restaurant: choose a small (ie. six inch) sub or pita with lean protein (grilled chicken, turkey), plenty of vegetables, and a lite or oil-based dressing or hummus. Mexican restaurant: choose a burrito without rice, with plenty of vegetables, and with lean protein (beans or chicken) or choose tacos with lean protein (fish, chicken, or beans) and plenty of vegetables. For a topping pick just one of the following: cheese, sour cream, or guacamole. Enjoy your meal: Sit down while you eat. Fast food is known as a meal on the go. Many people eat in their cars or while doing another activity. If you are distracted, you may not pay attention to how much food you are eating, and you may eat much more than you need. Sit down at the restaurant you visit and pay attention to your meal. If you can’t sit, eat just a little and save the rest for later. That way you won’t be starving once you have the chance to sit and finish your meal, and you’ll be less likely to overeat. Where can I find nutrition facts about fast food? The FDA (Federal Food and Drug Administration) has proposed labeling requirements for all fast food restaurants (some states have already passed laws like this). Restaurants with twenty or more locations are required to post the calorie content of foods on the menu. You can use these calorie amounts as a guide to see how much you’re eating at a meal. Remember that just because something might be lower in calories than another item, that doesn’t necessarily mean that it is “healthier.” For example French fries might be lower in calories than a grilled chicken sandwich, but you’d be better off picking the sandwich because it is lower in fat and has more protein. Most fast food and restaurant chains also offer nutrition information online. Use a search engine to find the company’s web page. There is usually a link to the nutrition section on the home page where you will find nutrition facts, including fat, cholesterol, sodium, protein, calories, and more for each product. Many of these menus are now interactive as well, so you can preview your plate and modify it to be more nutritious. Take a look at this information to help you make healthier choices when eating out. Some chain restaurants may also have some of their menu options listed on food and diet trackers like MyFitnessPal, FatSecret, and Calorie King. However, use these sites with caution because not all information entered may be accurate. If you don’t have time or access to a computer, many restaurants offer nutrition pamphlets in the restaurant or have a way of pointing out healthier options on their menus. Remember to balance fast food with nutritious foods throughout the day and make healthier choices whenever possible. There are many healthy food choices that are easily available, tasty, and don’t cost very much that can be eaten on the go. If you like fast food, try to limit it to once a week and choose healthy options. I heard you’re supposed to limit yourself to only one fatty food a week. Is this true?